Contrarian Investing - What Does It Mean? 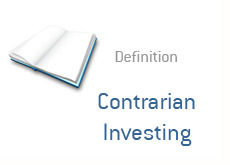 What is the definition of "contrarian investing" or being a "contrarian" as it applies to the stock market? First off, let's look at how the dictionary defines the word "contrarian". A "contrarian" is a person "who takes an opposing view", or one "who rejects the majority opinion". A contrarian is someone who is zigging while everyone else is zagging; a contrarian is someone who is going left, while everyone else is going right. That's a contrarian. The market plummets to new lows. Investors are in a panic, and are dumping their shares en masse without even thinking twice about it. They are scared about the future direction of the market, and they simply want out, and NOW. Investor sentiment is extremely negative. The contrarian investor may look upon this as a great buying opportunity. They figure that this massive selling is only creating some great buying opportunities, and that the baby is being thrown out with the bath water. While everyone else is selling, they are buying hand over fist. XYZ reports very strong Q3 earnings, and the shares hit a new 52 week high. Investors are pouring into the company, and the shares have been steadily increasing in price for weeks. The general opinion is that XYZ is a juggernaut, and that the shares are undoubtedly going higher. A contrarian investor may feel as though XYZ is overvalued and initiate a short position. Maybe there is something in the earnings report that they don't like, or maybe they just feel as though the upwards surge is overdone, and that XYZ is destined to trade lower. Once again, this is a contrarian investor at work.